HEK293 cells were transfected with GFP-MARK1, GFP-MARK2, GFP-MARK3 and GFP-MARK4 and 20 ug of the cell lysates was subjected to SDS-PAGE, transferred to nitrocellulose membrane and immunoblotted with anti-MARK4 (1 – 20) [S257C] antibody. 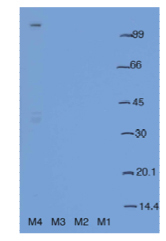 Binding of the primary antibody was detected using rabbit peroxidase conjugated antisheep IgG antibody (1:10.000 dilution, Pierce) followed by enhanced chemiluminescence (ECL, Amersham). LKB1 is a master kinase that activates 13 kinases of the AMPK subfamily, including MARK/P AR-1.